We have a superb range of reliable and expertly designed ratchet wrenches, impact wrenches and complete air wrench kits from industry leading brands such as Milwaukee, Ryobi and Kielder. Regardless of whether you’re doing home DIY or you’re a professional tradesperson, impact wrenches can be incredibly useful tools, especially where vehicle repairs are concerned. Used in circumstances where a manual wrench wouldn’t be able to complete the task, impact wrenches have an electric or air motor that applies a strong twisting motion, usually in short bursts to loosen or tighten a nut or bolt. They’re indispensable for jobs requiring assembly, disassembly, tightening or loosening, for example, changing car tyres. Versatile and powerful, our impact wrenches come with four torque settings to make light work of the removal of nuts and bolts. Our ratchet wrenches are a great choice for your garage or workshop, with their powerful torque and RPM perfect for the shop floor. Alternatively, if you’re looking for something more all-encompassing, we have a variety of excellent air wrench kits that would make a great addition to any DIY tool box or workplace. Both the ratchet wrenches and air impact wrenches we offer can be applied to the air compressors available from SGS, and we also supply the relevant impact socket sets needed. Heavy duty and robust, these tools feature a sturdy rubber grip to make sure you can effectively and securely complete your task. We have a 60 day returns policy for unwanted items. 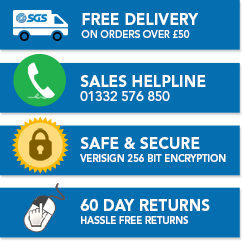 If you have any further questions about prospective or existing orders you can contact our customer services team by email sales@sgs-engineering.com or telephone 01332 576 850.